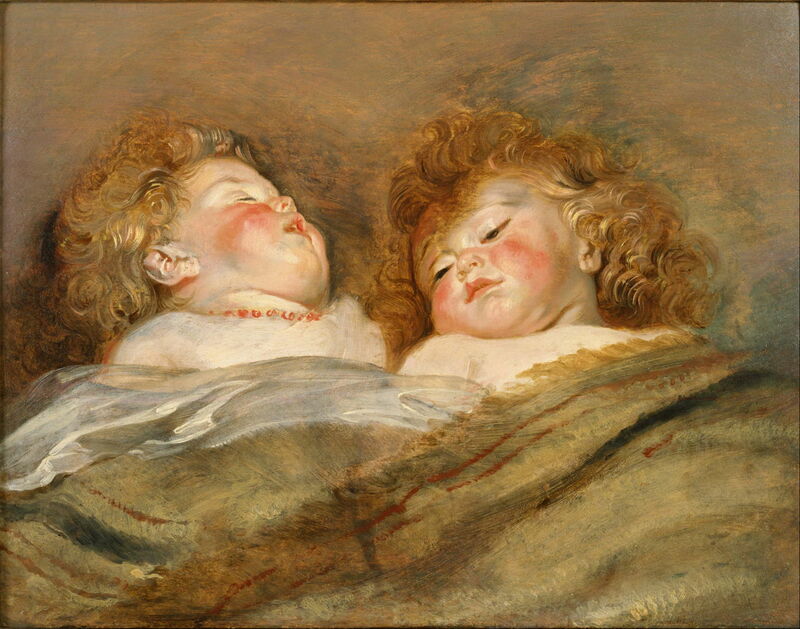 Peter Paul Rubens (1577–1640), Two Sleeping Children (c 1612-3), oil on panel, 50.5 x 65.5 cm, National Museum of Western Art, Tokyo. Wikimedia Commons. Take a close look at many paintings, particularly those from about 1870 onwards, and you will see the marks made by the artist’s brush, palette knife, even fingers. I will shortly be reviewing a book which takes a radical and novel look at brushstrokes in paintings, but which does not explore their history. This short series of articles is therefore intended to complement that review, in glancing through some of the unofficial history of visible brushstrokes and other painter’s marks. Put simply, I want to find out how we got from the Northern Renaissance obsession with the depiction of surface texture and the effects of light – leaving no marks or other evidence of the making of the painting – to the profusion of obvious marks which was distinctive of the French Impressionists. Jan van Eyck, The Madonna of Chancellor Rolin (detail) (c 1435) oil on panel, 66 x 62 cm. Musée du Louvre, Paris (WikiArt). 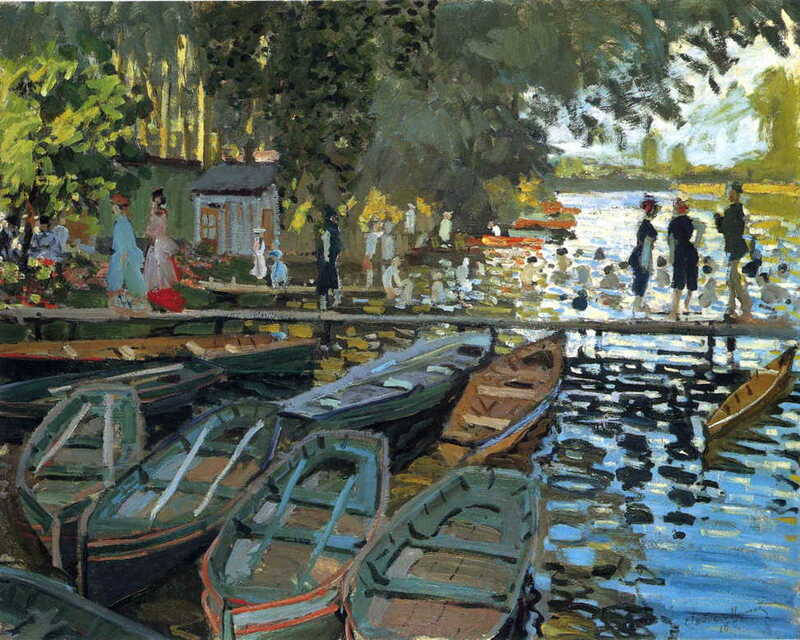 Claude Monet, Bathers at la Grenouillère (1869), oil on canvas, 73 x 92 cm, The National Gallery, London. WikiArt. If you have managed to sneak up and take a really close look at even those masterpieces from around 1400, you can still spot the occasional passage where the painter – who of course could have been another person in the workshop of the Master – has been a little more abandoned. 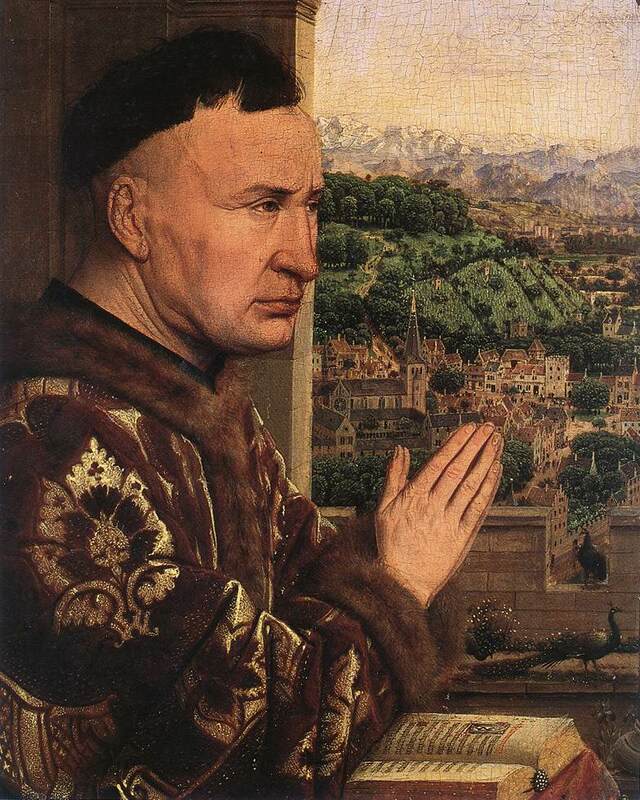 I have two examples from the workshop of Jan van Eyck which show this. 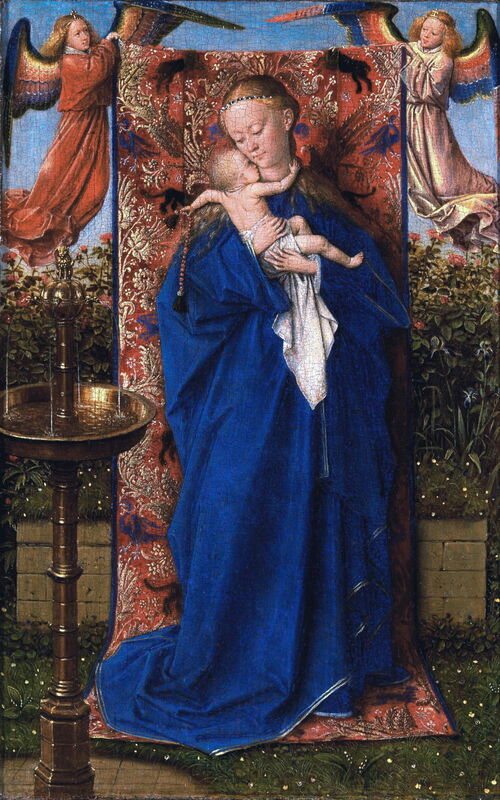 Jan van Eyck (c 1390–1441), Madonna and Child at the Fountain (1439), oil on panel, 19 x 12 cm, Royal Museum of Fine Arts Antwerp, Antwerp. Wikimedia Commons. The great majority of the surface of the Madonna and Child at the Fountain (1439) is, as usual, finished without a trace of a mark. But look at the water surface in the fountain of the title, and the bright reflections on the water are slightly more painterly. 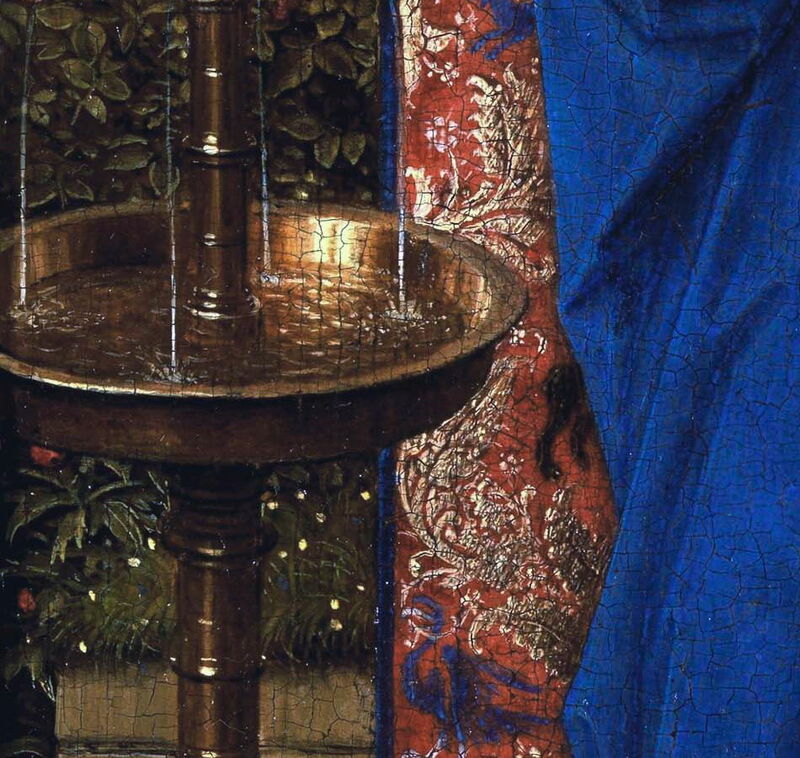 Jan van Eyck (c 1390–1441), Madonna and Child at the Fountain (detail) (1439), oil on panel, 19 x 12 cm, Royal Museum of Fine Arts Antwerp, Antwerp. Wikimedia Commons. Another type of passage which can sometimes become a little less tight and slightly more gestural is rough vegetation. 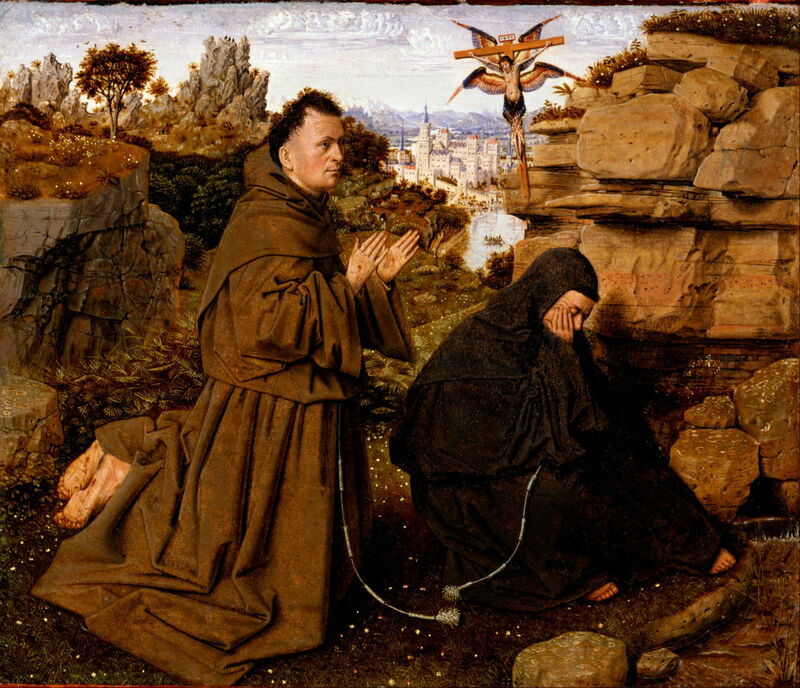 A well-finished panel, attributed to Jan van Eyck, is Saint Francis of Assisi Receiving the Stigmata (1430-2). Jan van Eyck (c 1390–1441) (attr), Saint Francis of Assisi Receiving the Stigmata (1430-2), oil on vellum on panel, 12.7 x 14.6 cm, Philadelphia Museum of Art, Philadelphia, PA. Wikimedia Commons. Here are more gestural marks showing the vegetation, flicks of the brush, which contrast with the painstakingly tight work elsewhere. 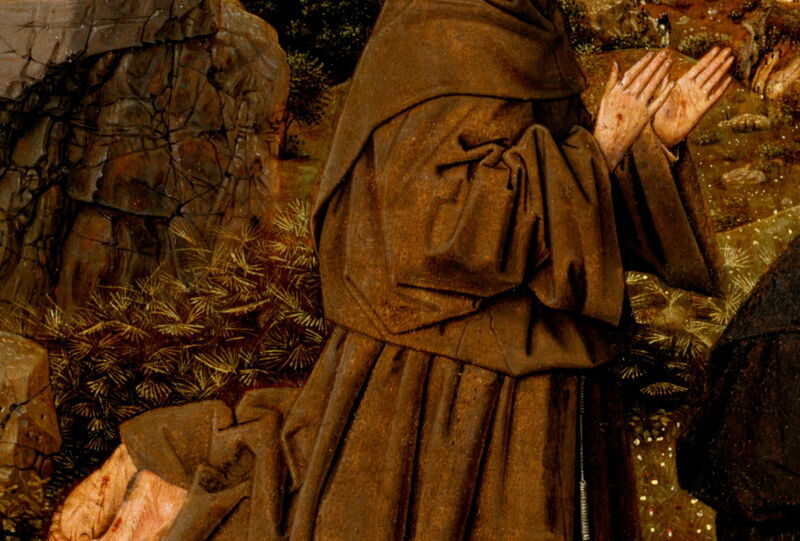 Jan van Eyck (c 1390–1441) (attr), Saint Francis of Assisi Receiving the Stigmata (detail) (1430-2), oil on vellum on panel, 12.7 x 14.6 cm, Philadelphia Museum of Art, Philadelphia, PA. Wikimedia Commons. As realism became progressively refined and more general through the Renaissance, there was little place for the painterly. El Greco (1541-1614) was an exception, leaving visible brushstrokes in some of his paintings, such as The Annunciation (1614) and The Vision of Saint John, or The Opening of the Fifth Seal (1608-14). The best passages in which to look for them are those depicting fabrics, although they can also appear elsewhere. My next encounter is in the paintings of Peter Paul Rubens. Not his finished works, but the many oil sketches which he left, revealing his exceptional talent, and a much looser style. This breathtaking study of Two Sleeping Children (c 1612-13) looks very much later and looser than the regular Rubens’ you will have seen. Looking at the detail of the bedclothes, there are abundant marks visible. As in the works of Rembrandt, and others, textiles and fabrics are often the place to look for brushstrokes and other marks, where they give a very ‘natural’ feel to the material. We also need to be a bit cautious in over-interpreting what we see four centuries later: because of changes in the paint layers, particularly increasing transparency of some with age, we may not be seeing what the artist intended. Peter Paul Rubens (1577–1640), Two Sleeping Children (detail) (c 1612-3), oil on panel, 50.5 x 65.5 cm, National Museum of Western Art, Tokyo. Wikimedia Commons. 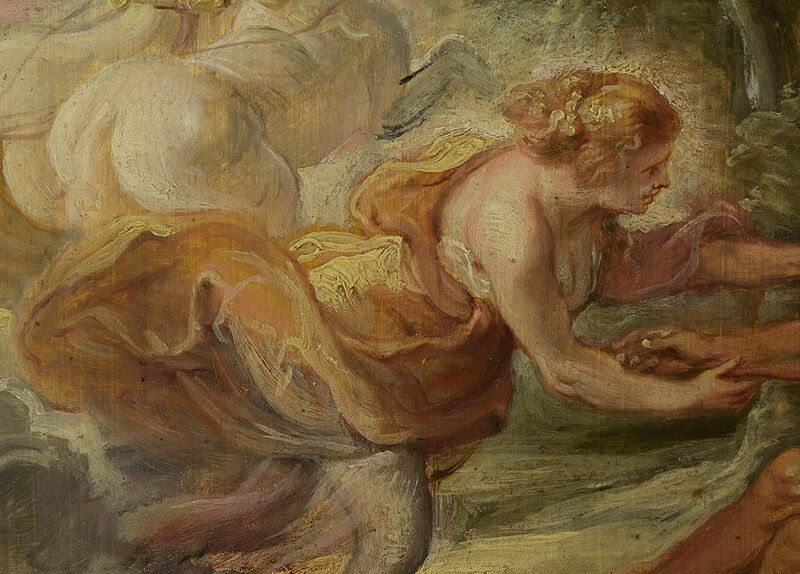 A further example is in Rubens’ study showing the Expulsion from the Garden of Eden (1620), where we do not even need to look at details to see the making of his marks. Peter Paul Rubens (1577–1640), Expulsion from the Garden of Eden (1620), oil, dimensions not known, National Gallery in Prague, Prague. Wikimedia Commons. 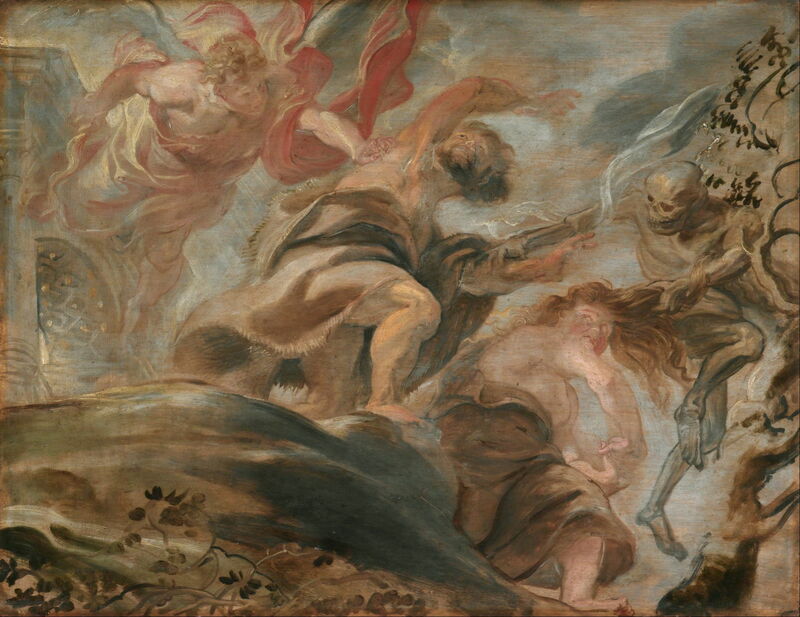 My final painting from Rubens is an oil sketch, or modello, which he made of Aurora abducting Cephalus (c 1636), for one of a series of works which were commissioned by Philip the Fourth of Spain to decorate his hunting lodge just outside Madrid. 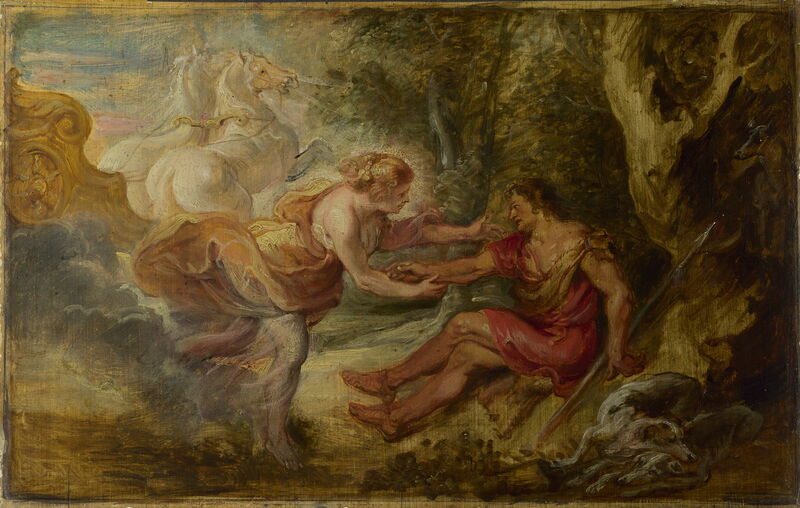 Peter Paul Rubens (1577–1640), Aurora abducting Cephalus (c 1636), oil on oak panel, 30.8 x 48.5 cm, The National Gallery, London. Wikimedia Commons. His marks are even more obvious in the detail view, and again are most prominent in fabrics. Peter Paul Rubens (1577–1640), Aurora abducting Cephalus (detail) (c 1636), oil on oak panel, 30.8 x 48.5 cm, The National Gallery, London. Wikimedia Commons. 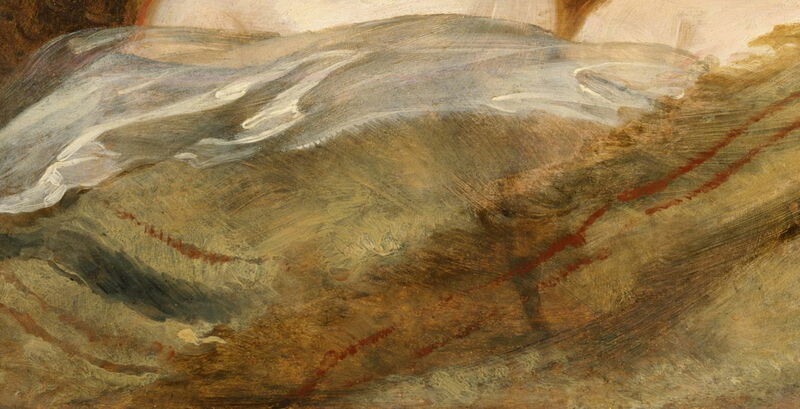 The other Master whose work shows brushstrokes like no other until the nineteenth century is of course Rembrandt. Best-known for his large and highly-finished paintings, the unique exhibition of his late works in Europe in 2014-15 showed how radical were his changes in style. 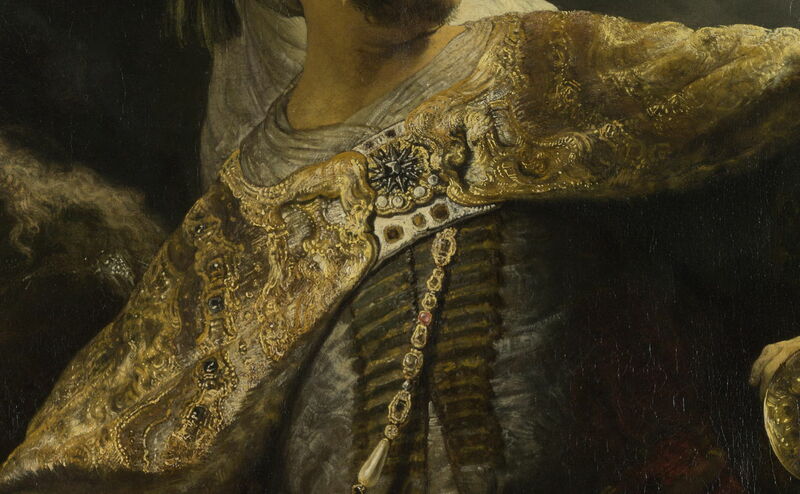 These started when he was still enjoying commercial success, during his marriage to Saskia, as shown in this detail of some of the fabric of clothing in Belshazzar’s Feast (c 1635-8). Rembrandt Harmenszoon van Rijn (1606-69), Belshazzar’s Feast (detail) (c 1635-8), oil on canvas, 167.6 x 209.2 cm, The National Gallery, London. Courtesy of the National Gallery, via Wikimedia Commons. Rembrandt Harmenszoon van Rijn, The Jewish Bride (c 1667), oil on canvas, 121.5 x 166.5 cm, Rijksmuseum, Amsterdam. Wikimedia Commons. His mark-making increased, both in the passages in which he left visible marks, and in the surfaces which he marked, right up to his death. 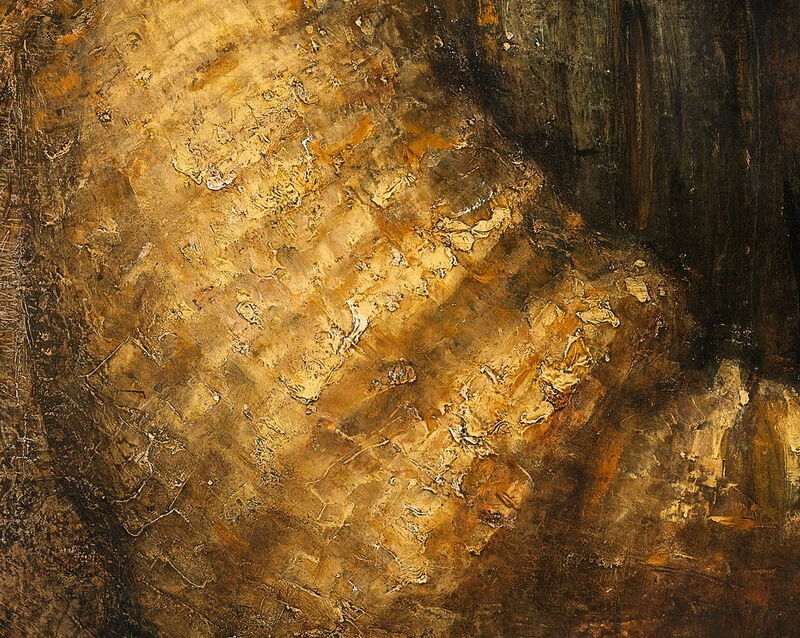 It appears in the hands of the elderly, the glint of a knife, but above all in fabrics, as shown in this detail of The Jewish Bride of about 1667. 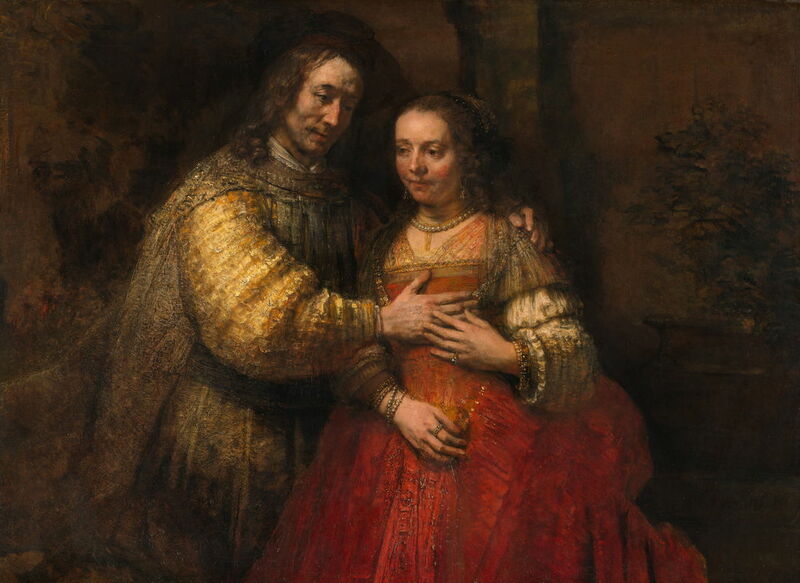 Rembrandt Harmenszoon van Rijn, The Jewish Bride (detail) (c 1667), oil on canvas, 121.5 x 166.5 cm, Rijksmuseum, Amsterdam. Wikimedia Commons. Inevitably, this led to criticism, for making his paintings ‘so coarse’, just as was going to happen two centuries later to Monet and his colleagues. For, as far as I can tell, Rembrandt was the first painter to intentionally leave prominent passages in finished paintings with obvious brushstrokes and other marks. Bikker J & Weber GJM et al. (2014) Rembrandt, the Late Works, Yale UP. ISBN 978 18 5709 557 9. Sutton P, Wieseman ME, van Hout N (2004) Drawn by the Brush, Oil Sketches by Peter Paul Rubens, Yale UP. ISBN 978 0 300 106268. Posted in Painting and tagged brushstrokes, El Greco, gesture, knife, mark-making, Monet, painting, Rembrandt, Rubens, van Eyck. Bookmark the permalink.